In deepest Devon, I arrived to find a serene atmosphere at Lignum Surfboards after a long drive from London. Decadent beats softly bounced off an abundance of wood which lined the walls of the workshop. I found two twenty something’s – friends working symbolically, each caressing wooden surfboards by using sight and touch as sensory tools to assess how fair (smooth) their surfboards boards were. Both looked wholly dedicated, engrossed even, and I felt as if I’d disturbed them. A Rhodesian Ridgeback strutted towards me through the sawdust like a lion and Lignum Surfboards’ co-Founder Alen Van Rooyen, a friend I met some years ago in Saint-Tropez, introduced me to this majestic hound called “Nora”. She was most docile but also gifted, like her owner, with a zen-like manner. Click on the play sign above to watch Emily Harris’ video for Festool at Lignum Surfboards in 2018. After acclimatising to the atmosphere, Lignum Surfboard’s co-Founder Harry Robinson took me up on my request to be walked through the process of making one of these beautiful looking wooden surfboards. I needed this guide, especially after picking one of these surfboards up and being so surprised at how light they are. We started at the back of the workshop. Alen fired up their "home-built" CNC machine. I paused, home built? Yes, hours and hours he said were spent configuring software and hardware to produce a system for cutting out components that make up the framework inside the board. Alen and Harry reckon ‘countless months’ were spent on R&D, developing designs and a viable construction method for their wooden surfboards. After a reasonably brief session watching the CNC cut the components for the guts of the surfboard, the next stage started to involve power tools and standard woodworking machinery. “I can’t believe you boys make wooden surf boards for a living”. Lignum was using the high precision power tool brand Festool. They started by illustrating all of the milling work using routers and saws; they then assembled the framework cut out by the CNC machine and proceeded in glueing the framework components on to the bottom “skin”, this being the bottom of the board which has been jig sawed out. They then planed wood for the rails – to make up the edges of the board. Alen and Harry are both seeking precision and accuracy as they use the saw, router and electric planer at these stages. Everyone's looking for precision and accuracy you might say? Of course, but that’s not necessarily why Lignum Surfboards use a host of Festool tools. Its Festool’s performance and the brand’s dust extraction systems that sold it to both Alen and Harry. Alen tells me he's used Festool's products for a bit longer than Harry. Firstly through Festool being a familiar brand through his father's tool collection but then predominantly using them ever since graduating from Lowestoft Boat Building College in 2010. When Alen co-founded Lignum Surfboards in 2016, he introduced Harry to Festool. The brand soon became items on the wish list for Lignum Surfboards, and finally, after lots of saving, Festool later became the most dominant brand in their collection. Harry remarks “I just couldn’t imagine using any other make of power tool now. The quality of the Festool tools reflects the quality of the work that we can produce”. These high-performance tools were undoubtedly being pushed near to the limit, going on the amount of sanding Lignum do to reach their desired finish. Alen and Harry were shaping for hours. Compared to some of the small to medium sized woodworking shops I've been to, I was surprised at how little dust floated in the air. Usually, you breathe the stuff in as if its part of the authenticity of working with a natural product. In this day and age though, that is such a farce. The difference was the Festool dust extraction systems, which are vacuums they had plugged into a variety of the tools at respective stages. During the sanding process, the workshop had strangely good visibility. Sanding and shaping the board is perhaps the archetypal scene to place Alen in. He loves it. They both seemed to but with a chisel and plane tattooed, one on each forearm, Alen was in his element. Equally, watching the shaping up of the surfboard is art in motion. After seeing such an angular shape presented in the middle stage of production, and then to see it treated with a softer form and a more organic, natural figure is so satisfying to the eye. It is very apparent; these guys care enormously about preparing the boards for their natural environment. Each design is unique, often supplied by the client and computer modelled ready for the CNC machine – among Lignum Surfboards customers are A-list surfers (check their Instagram), and they recently produced wooden prizes for the surf event Boardmasters. These warm, golden surfboards are found hung in houses as emblems to celebrate the craftsmanship and their structural form over and above their application. In the water, by nature of the wood's colour, they contrast the surf, offering themselves as ombré trophies. Seeing the wood shine in a surf environment begs the question: Are these wooden surfboards the discerning coastal person’s must-have item whether on the beach or the wall? When asking Alen and Harry how they achieve such a high quality in the finish, so much so that they have become works of art, they returned to their process of sanding and finishing. Harry points out while touching the pad of the sander, that any little marks and scratches left on the board will “always come back and haunt you”. The cause of marks can be due to working with different grain densities in the Cedar he explained; the type of wood is a slightly unstable material, thus achieving a super fine finish is paramount and intensive when it comes to sanding. Only through the Festool range of sanders, their sandpaper with different grits, the backing pads that Lignum Surfboards use at various stages of the process and, together with the dust extraction systems, they say they can sand the boards in half the time it used to take them! The sanding time currently stands at four hours. What instigated Alen and Harry to found the company? After asking they smiled, they acknowledge that they’re lucky in turning a natural material into wooden surfboards for a living. As Harry puts it, [it is] “the stuff that dreams are made of”. Then they again laugh. And Harry recalls a time when someone said to them “I can’t believe you boys make wooden surfboards for a living”. 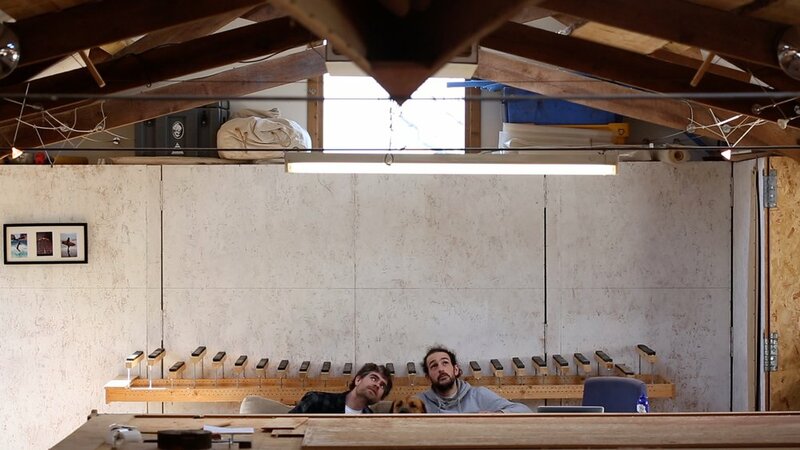 On the subject of job satisfaction, Alen and Harry talked about Lignum Surfboards' workshops. A range of people attend these workshops where you come and make your own wooden surfboard! Some are city-workers looking for respite in their busy lives and, to use their hands to create something worth-while. Their attendees can do that here in a matter of days while surfing in the afternoon. Alen describes completing the build of a surfboard here “[your] walking down the beach for the first time with it under your arm, cradling it almost, it’s such a precious thing […] and then paddling out, sitting there waiting for that first wave… it is just, its a really soulful experience. You stand on your board, and you’re like I made this! I’m harnessing nature with the creation that I made.”. Harry brought the conversation back to more about what can be accomplished at one of the workshops. He focused on talking about the material, wood and how their location in Devon allows them to take full advantage of the locally sourced Cedar planted after the Second World War. He explains that this allows for their surfboards to made sustainably, adding that because of Lignum’s R&D the local Cedar is also a material that gives customers “very similar characteristic to its plastic counterpart”. As the two-day video shoot came to a close, so unmistakable was Lignum’s dedication to design, craft, process and how fundamental it seemed dust extraction is to the finish, enabling them to eliminate marks. “We’re after the highest standard, and I think Festool offer the highest standard” as Harry says in the video. I’m sold. In fact, for me, a semi-constructed surfboard hung on a wall would be equally as impactful as an impeccably finished one. And as for Nora, the dog, it was tough doing the sound recording with her around, but she’s adorable. Alen and Harry take on private commissions that involve the craftsmanship they showcase with their surfboards.